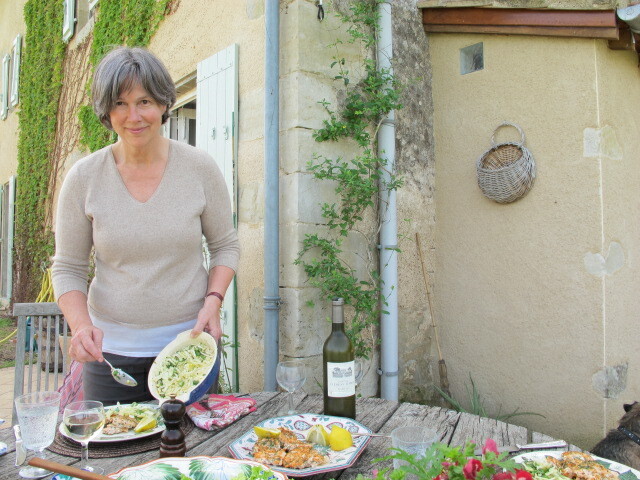 There’s a recipe in both my cookbooks–and they are the most visited on the blog. I am not alone in loving them! They were always a favorite with me–but were off the menu after my diagnosis because they usually share the space with an equal mount of mashed potatoes (sometimes more, one suspects, in restaurants!). Potatoes have a very high glycemic index rating–mashed especially. So when I spotted the alternative versions, I was delighted. 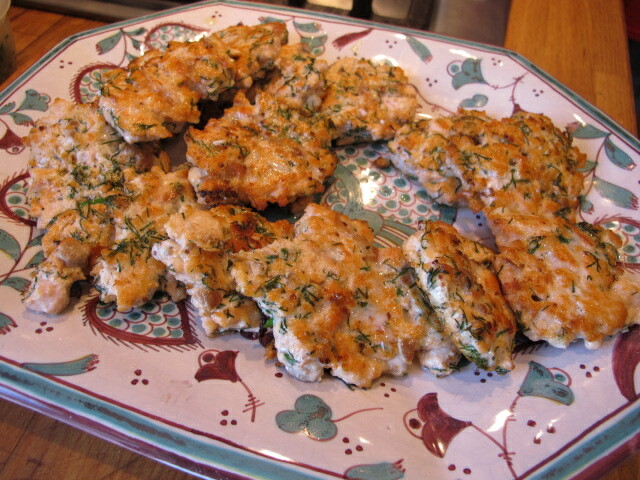 One recipe mixes the salmon with smoked haddock; another adds fresh dill. 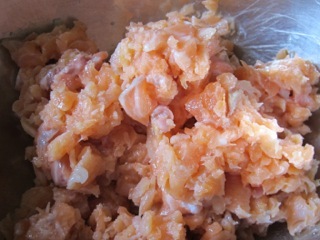 These secondary ingredients are not always easy to find—so here is a third version with the perennially available smoked salmon. My local supermarket sells 200gm/8oz packets of smoked salmon off-cuts—-perfect for this and less expensive than traditional slices. 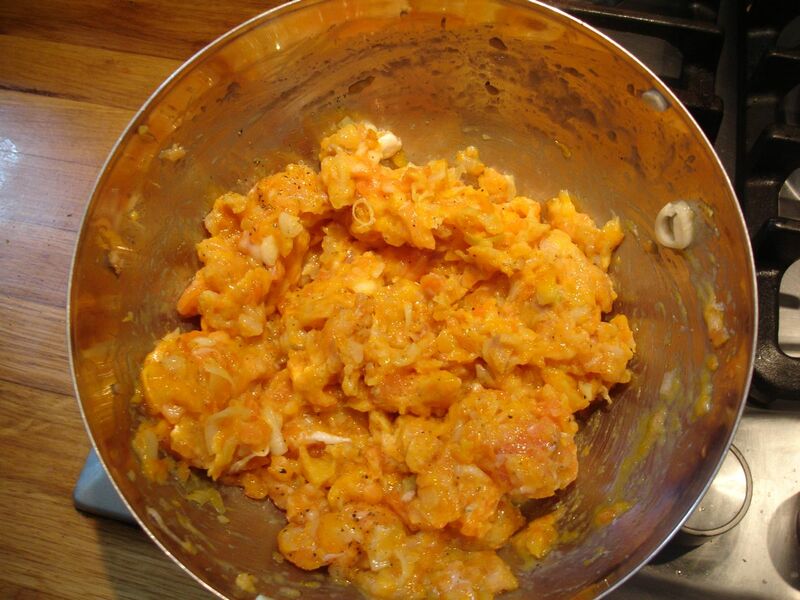 Pulse them briefly in a food mixer–they should not be mushy. Carefully turn in the rest of the ingredients. 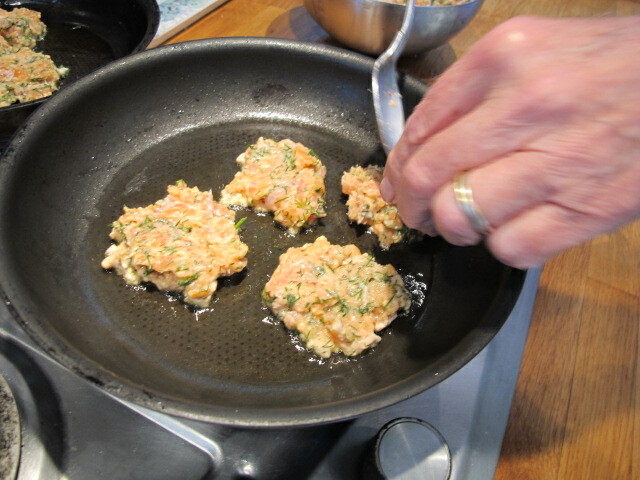 Scoop out the mixture and form your patties (I use a tablespoon.) Don’t “overwork” the mixture. 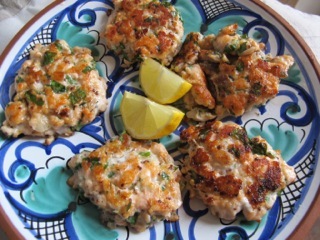 If you have time, cover and refrigerate for half an hour or so–it helps firm up the fishcakes. Heat the oil to HOT in a frying pan. Very important that the fishcakes cook in hot oil. 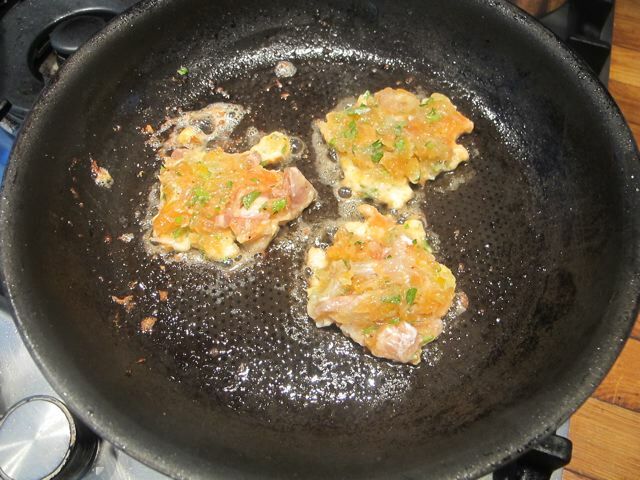 When you see the milky liquid appearing from inside the fishcakes, they are READY. Whisk the yogurt smooth and stir in the mustard and salt. 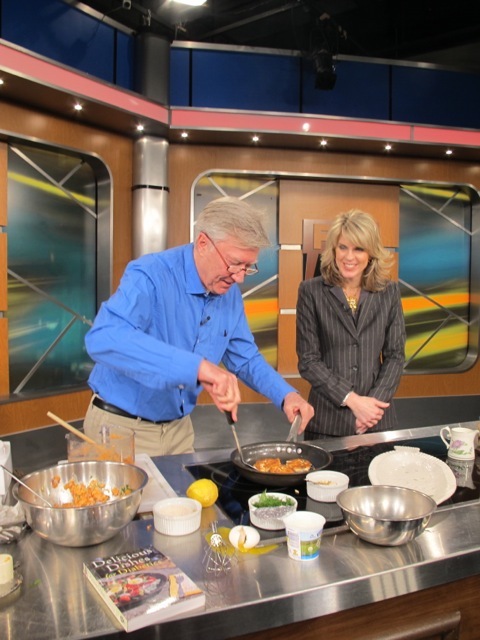 Just managed to fit in a cooking no-potato fishcakes session on Fox’s Channel 5 here in Washington with host Holly Morris, before we head for the airport. Another recipe based on a Nigel Slater recipe. 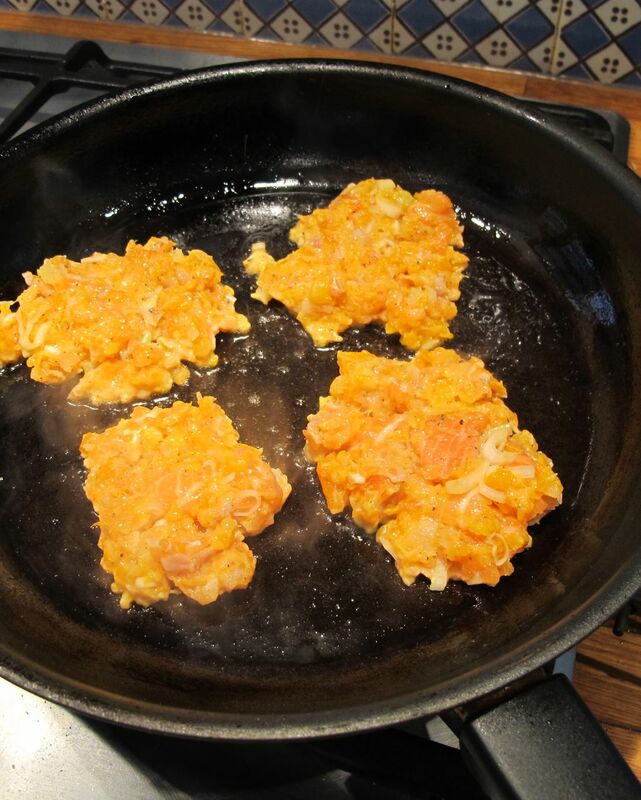 I have always loved fishcakes – must be the comfort food factor kicking in – but these days of course the fact they usually contain 50 per cent potato causes trouble for me as a diabetic.This recipe solves the problem by leaving the potato out! 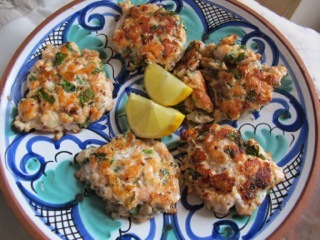 The dill and the grain mustard make the fishcakes special and they sometimes serve as a tasty starter. 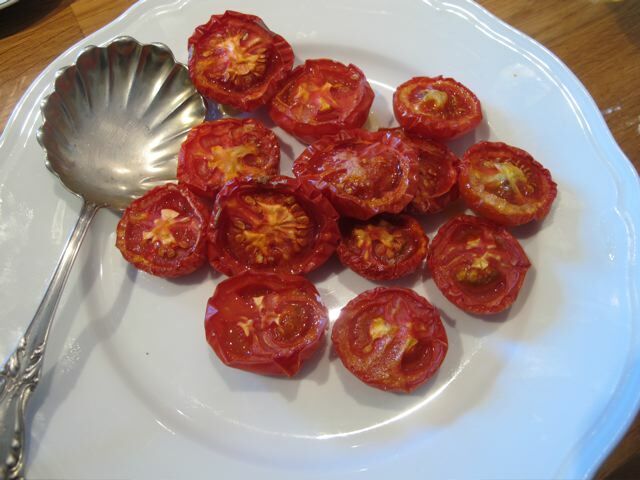 If you keep them small and cook them quickly, they’ll be crisp and brown on the outside and still succulent inside. Mix all the yogurt sauce ingredients and refrigerate until you are ready to eat. 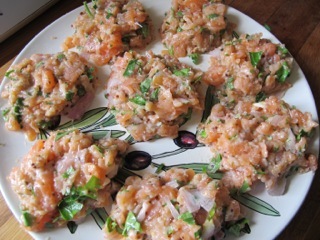 Cut up the salmon fillets in roughly equal-size pieces. Put these in a mixer and pulse three or four times. Avoid working them too much and producing slush at the end. You could just cut them up in small pieces if this suits better. 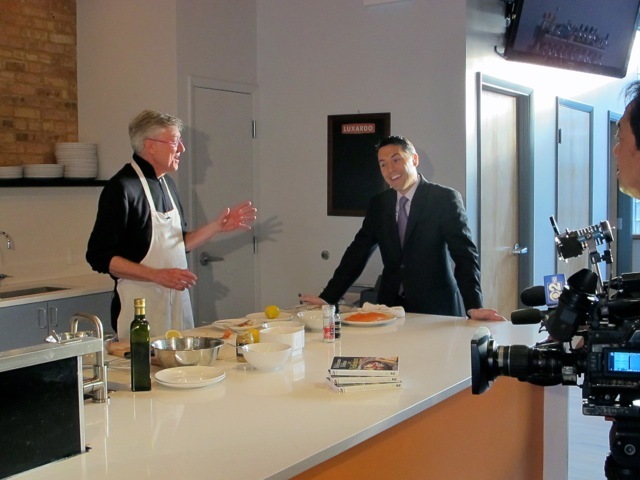 Put the salmon in a bowl. Turn in the egg white and the flour, and then the mustard, lemon juice, and the dill. 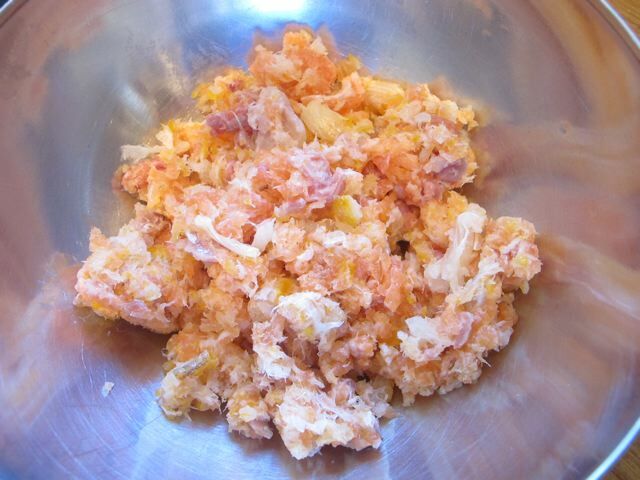 It’s a good idea to taste the mix for seasoning at this point – the dill and the salt should come through. Heat the oil to hot in a frying pan and using a dessertspoon scoop out a dollop and make a ball. Put this carefully in the pan and flatten it gently. Cook on a medium-high flame, crisping and browning the outside while making sure the interior cooks through–about a minute each side, taking care not to burn them. Serve with the mustardy yogurt dipping sauce on the side. 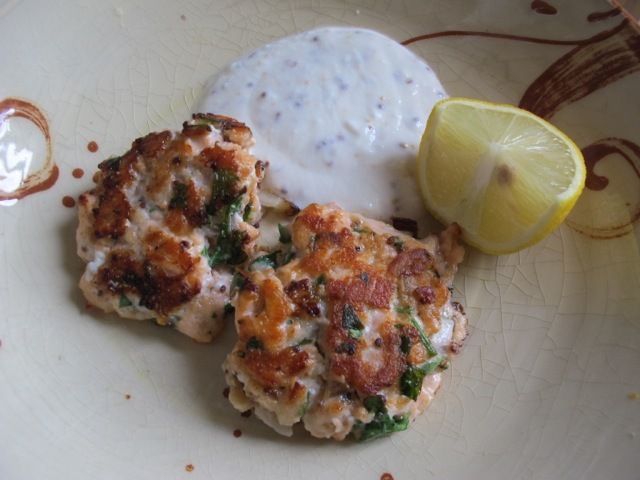 ‘No potato’ fishcakes: Winter and Summer–a reprise. 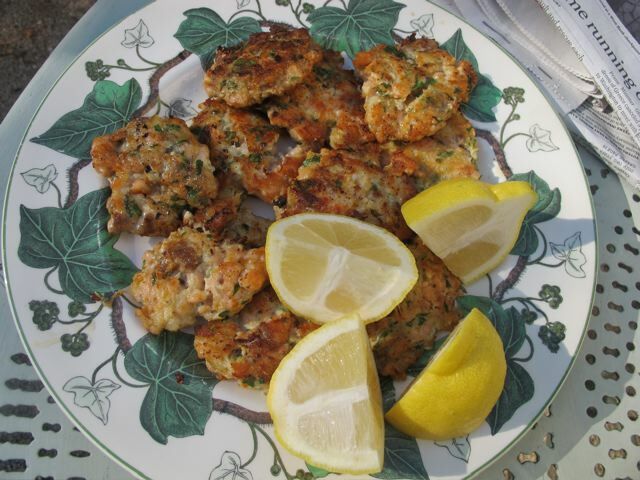 Below I reprise two favourite fishcake recipes that have proved popular. I think it’s worth tying them together because they are closely related–and worth sharing again for newcomers to the site. They each have an ingredient that nicely replaces the potato normally associated with fishcakes: Smoked haddock for the first, fresh dill for the second. 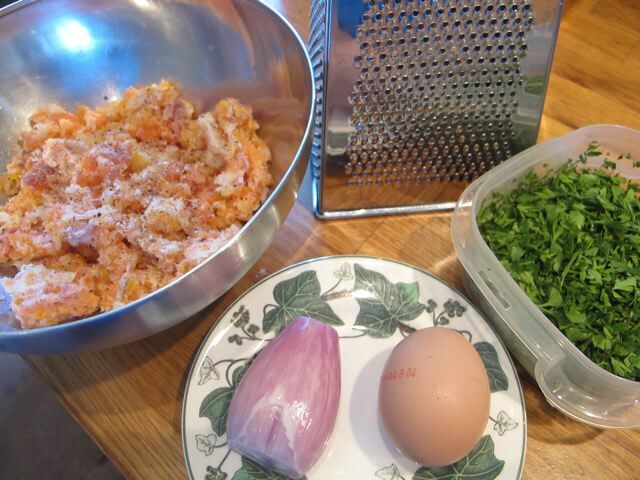 The first recipe, with smoked haddock, I once did as a starter on Christmas day–so I associate with winter. 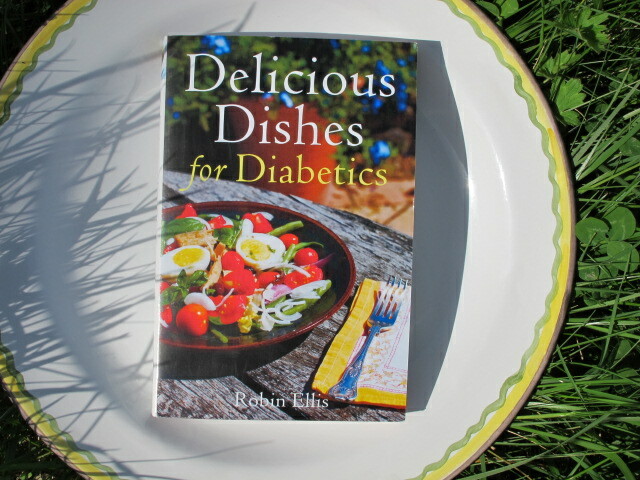 The second recipe, with dill–reprinted from my cookbook, Delicious Dishes for Diabetics–makes a for a tasty lunch outdoors in summer. Dill is not always easy to find–even in summer–so I sometimes substitute chopped parsley (but dill is better!). In truth, I’d willingly gobble either down, no matter the season! 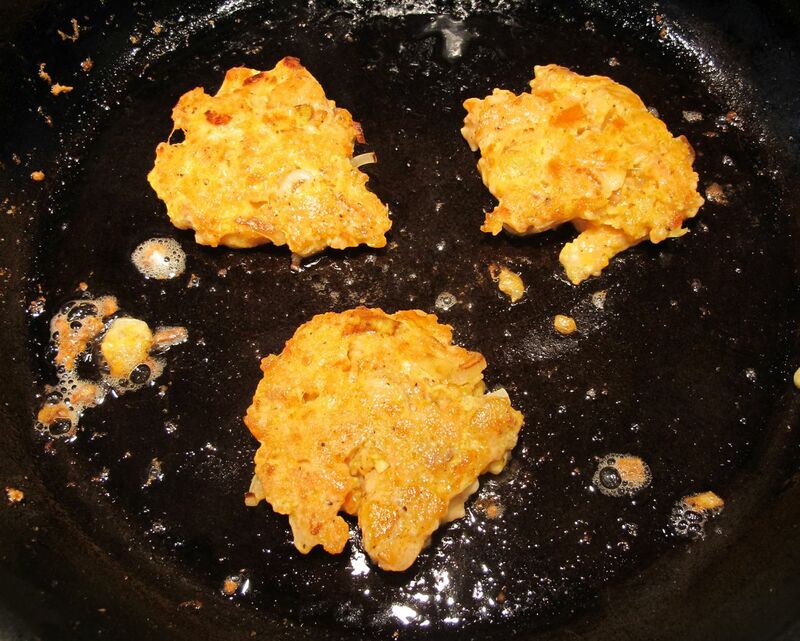 I used to love fishcakes–but the usual addition of mashed potato made them ‘off limits’ for me, once I was diagnosed with Type 2 diabetes. 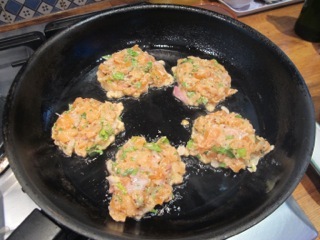 Then I found an alternative–no-potato fish cakes–and no longer felt deprived! My American wife tells me most Americans will find smoked haddock unfamiliar and maybe even daunting and hard to find–but from starting as a sceptic, she is a complete convert now. This is adapted from a Gordon Ramsay concept…. 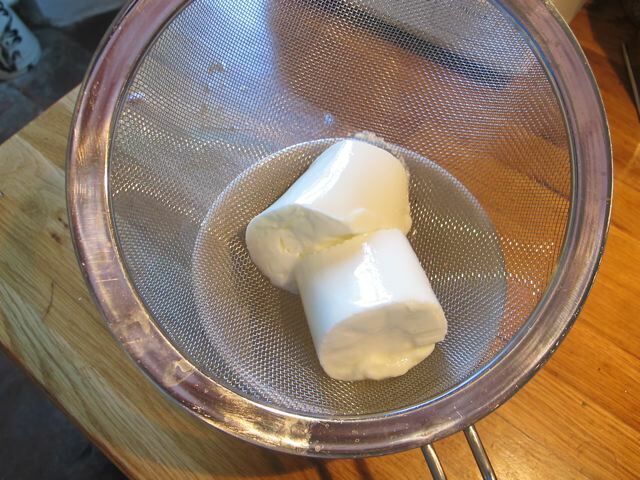 yogurt–I use no-fat organic, drained in a sieve for half an hour to thicken it. 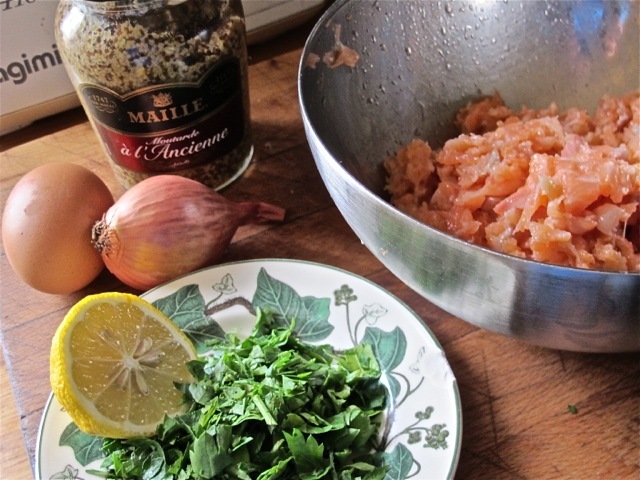 In a bowl, mix the fish with the grated shallot, parsley, salt and pepper. Chill in the fridge for an hour if you’ve time. When it’s hot sauté the little cakes for 2 to 3 mins each side. 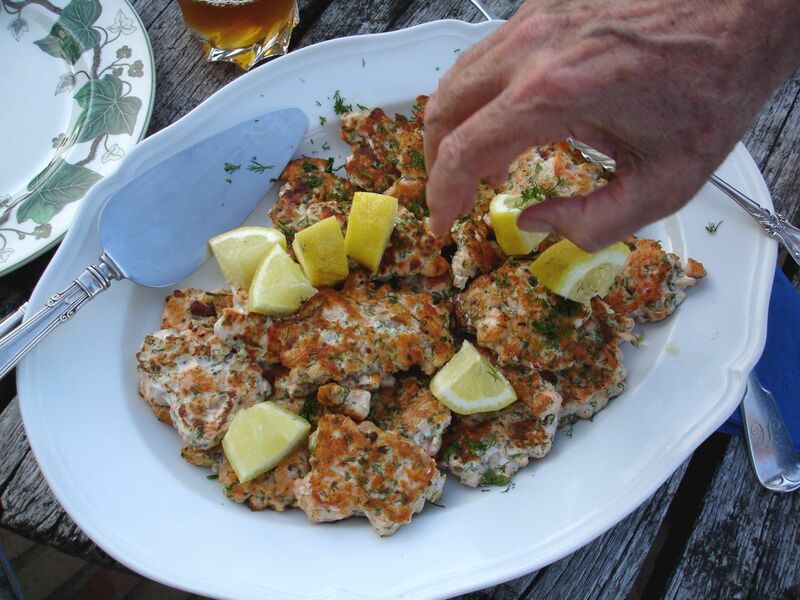 Serve with a small dollop of yogurt sauce (see recipe below); for this version of fishcakes, I’d omit the dill. The dill and the grain mustard make the fishcakes special. They can serve as a tasty starter too depending on the size. 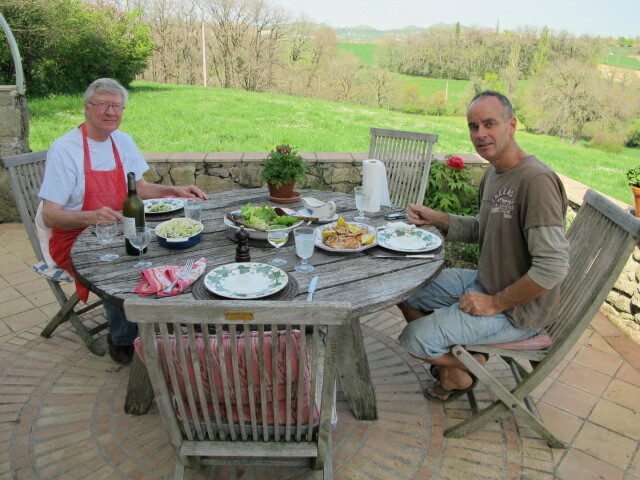 This version is adapted from one of my favourite British cooks, Nigel Slater. Turn in the egg white and the flour, then the mustard, lemon juice and dill. It’s a good idea to taste the mix for seasoning at this point–the dill and the salt should come through. Heat the oil in a frying pan and using a dessertspoon scoop out a dollop and make a ball. Put this in the pan and flatten it gently. Cook on a medium-high flame, crisping and browning the outside while making sure the interior cooks through.